22 December 2001 - May you and your loved ones enjoy the true meaning of Christmas and have a prosperous New Year. Let's all give thanks for what we have and pray for a more peaceful year in 2002. I'm going to take a few days off so unless something monumental occurs this will be the last update for 2001. And it's a good one. Jason Ashworth has released his new Mirage IIICZ. You can read about it here or download it here. Enjoy and we'll meet back here next year. 18 December 2001 - I've added a little holiday cheer to the opening page. Jason Ashworth's Mirage IIICZ project is coming along nicely. Jason sent a beta copy for me to fly around in FS2002. Here are some images and comments. 9 December 2001 - Alexandre Cadel has released a new scenery add-on for FS2000. The subject is the citadel of Bonifacio on the southernmost tip of the Island of Corsica. It's well rendered and make a nice addition to his previous releases. 2 December 2001 - Chris Coarse has released a new version of Kirk Olsson's Mirage F1 with new weapons loads for CFS2. The Air Defence weapons used are from Christophe Rosenmann's CFS2 Rafale M.
I have completed another set of alternate texture files for the Alpha Simulations Mirage IIIC. This set of files represents a Mirage IIICJ in the camouflage scheme of the Israel Air Force in the early 1970s. I have also put together a page around an interesting description of a dogfight between an Israeli Mirage and a Syrian MiG-17. 28 November 2001 - Today marks the second year anniversary of this website. There are a lot of people to thank for making this possible and some upcoming things to announce. So lets get to it. 25 November 2001 - Philippe Jacquot wrote to tell me that he had completed an update to his Base d'Etain-Rouvres (LFQE) scenery for FS2002. Improvements include new night lighting, tower, and hangers. On the subject of scenery, as you may be aware, Compuflight.com and the IFSA were attacked and all of their file browsing and search capabilities lost. This does not effect aircraft or panel downloads from this site but it does effect scenery downloads. Some of the IFSA mirrored servers located in Europe are still available for a short time. I have updated the scenery page to reflect these changes. 23 November 2001 - Mostly upgrades to existing aircraft this week. Christophe Rosenmann sent a new update to his Rafale M. This one includes opening canopy, an animated pilot figure, and a panel based on Oxyd's Rafale panel. Vasco Ferreir has released updated versions to his series of South African Air Force Mirage III and Mirage F1. Rainer Tschorn, an officer in the German Luftwaffe, had painted up a Cheetah in fictious Egyptian Air Force colors. An lastly, for those who have the Mirage IIIC from Alpha Simulations, I have completed a new texture set for an aircraft assigned to EC 2/10 "Seine". As I'm sure visitors have noticed, this website (and most others at flightsimmers.net) has been very slow in loading lately. I have made several adjustments to increase the overall speed. I will continue to research opportunities that will address the speed issues and ease of use of the site. 14 November 2001 - Fabien Prevost sent a copy of his new scenery for Reims-Champagne AB in northern France. The scenery, intended for FS2000, is very detailed and includes static Mirage F1s by Jason Ashworth/Marc Siméon. 9 November 2001 - Last month Christophe Rosenmann released a new Rafale M of his own design specifically for use with CFS2. This was followed by the release of two updates to the visual model and an update to the weapons load. With his permission I have combined the original and all updates into one download. Included are air-to-air weapon loads featuring Matra Mica and Matra Magic II missiles and a maritime load featuring MU90 torpedos. 4 November 2001 - Justin Lamb has repainted Oxyd's Mirage 2000C in the experimental desert scheme that was applied to at least one of the Armée de l'Air EC 2/5 aircraft that participated in Operation Daguet during Desert Storm in 1990. I've assisted by modifying the visual file to change some blue parts to a more correct sand color. Denis da Silva Oliveira has released a new panel for the Mirage 2000-5F. 28 October 2001 - "Sonny" has released a repaint of Thierry Romain's Super-Etendard in the camouflage colors of Aéronavale Flotille 11F. What will be of more interest are the included weapons and DP files for use with CFS2. He has also released an update package to make it easy to use Oxyd's beautiful Rafale M with CFS2. This is not a repaint but an add-on package including weapons files and DP files. 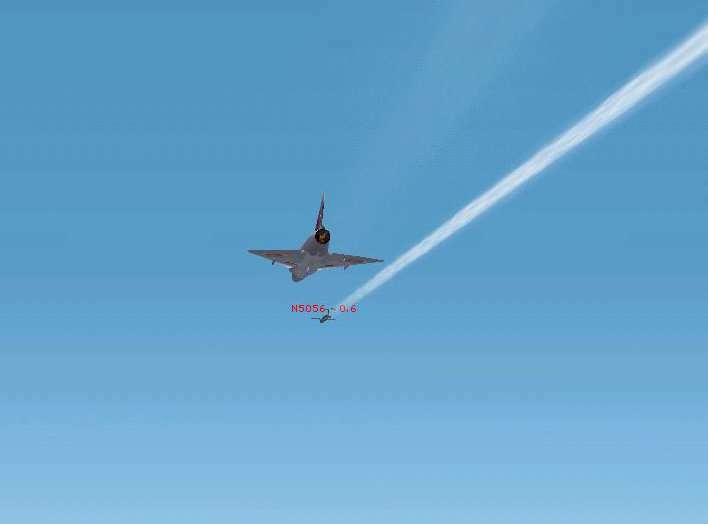 22 October 2001 - Alpha Simulations has released their Mirage IIIC. It is finished in natural metal and wears the colors of Armée de l'Air EC 1/5 "Vendée". An extensive list of weapons loads is included for CFS2. Additional unit markings will be available soon. Click on the image below for a photo review. 19 October 2001 - Sorry it's been so quiet. Thinus Pretorius sent an updated version of his Mirage IIIBZ in the special "SA Flag" air show colors. This new version is still based on the Mirage 2000 of Daniel Mrawek but has been modified. As you may be aware, CompuFlight was attacked and all of their file browsing and search capabilities lost. This does not effect aircraft downloads from this site but it does effect scenery downloads. Ferdy Serena of FSPlanet.com is working on getting the IFSA mirrored servers located in Europe back on line. FS2002 is scheduled to be released today. I had a sneak preview (about 10 hours worth) a couple of weeks ago and have to say that it is very nice. Even at low frame rates it was very smooth. The Auto-Generated (autogen) scenery is very nice along with great water effects (beaches, breaking waves, moving water, etc. ), a nice ATC component, and much better scenery. Also included are AI aircraft (to intercept) -- great fun at 30,000 feet. 8 October 2001 - Alexandre Cadel wrote to thank me for mentioning his Calvi scenery add-on. He also told me that he had a scenery add-on for Ajaccio, also on the Island of Corsica. While downloading it to test I found an Ajaccio scenery fix file Alexandre has released and an FS Traffic track file for the nearby Campo Dell' Oro airport (LFKJ). 7 October 2001 - Alexandre Cadel has released a nice FS2000 scenery add-on for the Island of Corsica. His city and Citadel at Calvi Ste-Catherine (LFKC) will make your laps of the island even more interesting. Olivier Bochu is in the process of updating his French Riviera Project. Several new scenery files are available. 30 October 2001 - I've added an excerpt from an old email conversation with Michel Gérard. We were discussing my repaint of Washington F. de A. Kuhlmann Jr.'s Mirage IIIB in the colors of Armée de l'Air EC 3/2 "Alsace", Michel's old unit. The aircraft is also available for download. 23 September 2001 - Denis da Silva Oliveira has released three new aircaft. The first is a Mirage IIIEBR in the current tactical scheme of the Brazilian Air Force. The remainder are repaints of the Daniel Mrawek's Mirage 2000C and 2000B using textures from Oxyd's Mirage 2000-5F. Both Mirage 2000 also include a fictitious blue/white camouflage scheme. 16 September 2001 - Recently there have been uploads of Jason Ashworth's Cheetah D as a Mach 3 capable Mirage III 'Cheetah X'. Besides being unauthorized changes to the original files, they represent an aircraft that is completely ficticious. Jason sent me a set of textures converted for use with FS98. The resulting aircraft is exclusively available here. I have also modified the original textures of Neels Smit to represent a Cheetah D assigned to the South Africa Test Flight and Development Centre. 9.11.2001 11 September 2001 - A senseless act, a true tragedy in every sense of the word. My thoughts and prayers go out to the innocent victims and to their families and friends left behind. I stood on top of one of the World Trade Center towers while on a stopover when returning from Europe back in 1976 and again in 1977. You could see forever. 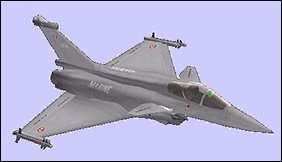 9 September 2001 - Alpha Simulations has released a new version of their Super-Etendard. This one is painted in the two-tone camouflage scheme of the Aéronavale Francaise. I've added some additional comments and screen shots to the earlier review of their Super-Etendard in Armada Argentina colors. Also in the image below is the newest French aircraft carrier, the Charles de Gaulle. The scenery add-on (for CFS2 only) is available on the scenery page and compliments the new Super-Etendard well. 6 September 2001 - I've found three Mirage recently that I'm including here only to keep the collection complete. The first is of a South African Mirage IIIBZ in the "SA Flag" colors. Unfortunately the repainter has chosen to use a Mirage 2000 for this aircraft. However, he has updated the aircraft with a clear canopy. The second is of a Chilean Mirage 2000 "Pantara". Again the wrong aircraft has been used; the Pantara is based on the Mirage 50, not the Mirage 2000. The last of the three is a Mirage IIICZ in natural metal with South Africa markings. 29 August 2001 - Manuel Marín Carrión, who repainted the Mirage F1 in four Ejército d'Aire versions has also produced scenery for Los Llanos Air Base in southwest Spain, the home of Mirage F1CE wing, Ala de Casa 14. I've also included a link to his website. 21 August 2001 - Another repaint of the Anton Coetzee/Yves Franckart Cheetah/Mirage V has been released. This time in the colors of an IAI Dagger of the Fuerza Aérea Argentina (FAA). Included are a set of great sound files, a modernized Dagger panel, and a new flight model (very nice) designed by a retired FAA officer. 15 August 2001 - Through TecPilot I've found a website covering the Mirage F1M (a modernized F1CE of Spain's Ejército d'Aire). Included are repaints of Jason Ashworth's Mirage F1 finished in four versions for Ala-14's 141 and 142 Squadrons: low visibility grey with false canopy, normal Ejército d'Aire 3-tone camouflage, a desert scheme (similar to that used by the Armée de l'Air in Africa), and a special 25th anniversary version (below). Also included is a new panel based on Mike McCormack's F1 panel, but it needs much work to become functional. 8 August 2001 - No new aircraft but some news about upcoming releases. Between school and work, Jason Ashworth has been working on a new Mirage IIIC for FS2000. He has been developing it along side the IIIE we saw earlier. The first version (below) will be a IIICZ in the special black and gold colors of the last flying IIICZ now performing at air shows in South Africa. It will be followed by a 'repainter friendly' camoflouged version. Phil Perrott of Alpha Simulations reports that they also have a Mirage IIIC in the works. It will be textured in an unpainted metal finish. This will be followed by a camouflaged Mirage 5F. Both will wear Armée de l'Air unit markings. As soon as I know more, I'll pass it along. 1 August 2001 - Another from my Michel Gérard archives. Continuing our discussion of Didier Bur's Island of Corsica and BA 126 Solenzara (CORSEV50.ZIP) scenery add-on, Michel sent a set of airport charts. These included an airport diagram, and the visual and TACAN/ILS approach plates. I've also found a set of FS Traffic tracks for the six civilian airports on Corsica. It should make things more interesting as you run laps around the island. 27 July 2001 - There was a problem with the Flightsimmers.net server yesterday so I couldn't upload any files. So here now is another repaint of Kirk Olsson's Mirage F1 for FS2000 by Y-Raymond. This one is in a bright polished metal finish sans markings. He indicates that anyone is free to use these textures as a starting point for their own F1 repaint. He has also provided a new &QUOT;aircraft.cfg&QUOT; file so that the original and his three repaints are available together in FS2000. 20 July 2001 - Matthias Hinze has released an update to his AfricaPlus scenery project for FS2000. The project covers over 50 airports on the African continent. Airports / Air Bases that include static Mirage aircraft include Djibouti and several in South Africa. 14 July 2001 - Y-Raymond has made available another repaint of Kirk Olsson's Mirage F1 for FS2000. This one is of F1 Prototype No. 3 as it appeared during the F1 development program and during demonstration flights at the 1969 Paris Air Show. 6 July 2001 - I've found a new version of Michel Hirmke's Salon-de-Provence (LFMY) scenery updated for FS2000. Also, there were problems with downloading scenery files last month. I've implimented a new system that should keep that from happening again and provide several possible servers from which to download each file. Thank you IFSA and Eldon Radda of CompuFlight for making this possible. 2 July 2001 - I stumbled upon this last night. One of the CFS2 sites, CFS2 Area 51 is recreating the recent Chinese F-9 and US Navy EP-3 mid-air collision. For the first version of the F-9 they have repainted Kirk Olsson's Mirage F1 as shown below. A copy is available on the Mirage F1 page. The download includes CFS2 DP files and a new panel. 30 June 2001 - Y-Raymond has made one of his repaints of Kirk Olsson's Mirage F1 for FS2000 available. This first release is an aircraft of Armée de l'Air E.C. 2/5 "Ile de France" in 1980. 24 June 2001 - Fabien Prevost has released a new FS2000 scenery for Cambrai-Epinoy Airbase (LFQI). Cambrai-Epinoy AB, located in the north of France, is home to EC 1/12 and 2/12. This very detailed scenery includes all buildings, hangars, HAS, static ground support vehicles, static Mirage 2000C, and other objects. 20 June 2001 - I've added another excerpt from an old email conversation with Michel Gérard. This time we were discussing Didier Bur's Island of Corsica and BA 126 Solenzara (CORSEV50.ZIP) scenery add-on. Having been there on several occasions, Michel had several constructive comments. 10 June 2001 - Y-Raymond wrote to say he has been working on some repaints of Kirk Olsson's Mirage F1 for FS2000. His first releases will include a prototype in unpainted metal finish and an aircraft of Armée de l'Air E.C. 2/5 "Ile de France". 4 June 2001 - There was a problem with downloading scenery files. That has been fixed. I've also added a link to Olivier Bochu's French Riviera Project scenery files for FS2000. 2 June 2001 - Alpha Simulations has made all of the aircraft in their Harrier Jump Jet package available for individual purchase/download in their FS Supermarket section. This includes their IAI Dagger in Fuerza Aérea Argentina colors, VI Brigada Aérea. 1 June 2001 - This website hit another milestone today with our 50,000th (50K) visitor. Thanks everyone for making this possible. To mark the occasion I've added a new navigation system along the left column so visitors can get around easier and find everything. Please if you have any problems using it. 23 May 2001 - I have not heard from Michel Gérard since September of last year. I truely hope he is in good health. While browsing some old email messages I found this description he gave of the Mirage IIIE that he selected for the top of his page. This will be the first in a series over the coming months. 15 May 2001 - Christian B. Alexandersen has modified Thierry Romain's Dassault-Breguet Super Etendard. The aircraft now includes an AS.39 Exocet missile and the animation and flight dynamics have been revised. The aircraft is painted in Armada Argentina colors. 11 May 2001 - Vasco Ferreria continues to work on his craft and has made available another aircraft in his series of South African Air Force fighters. This one is a Cheetah E in the markings of No. 5 Squadron. I've included it to keep the file archives complete. 6 May 2001 - I've added a few new links in all catagories including this well illustrated one entitled French Connection, describing an air-to-air refueling mission by RAF TriStar tanker in support of Mirage 2000 and F1s. 2 May 2001 - Alpha Simulations has released their Dassault-Breguet Super Etendard in Armada Argentina colors as an add-on to their Harrier Jump Jet program. It's available in their FS Supermarket section. I was given a sneak preview and have put together a page of screen shots. A camouflaged French Aéronavale version will follow shortly. 27 April 2001 - Harald Huber has released a second version of his Mirage 5 for FS2000. This time in the colors of a Mirage M-5MA &QUOT;Elkan&QUOT; of the Fuerza Aérea de Chile. The visual and flight models are unchanged from his earlier release. 21 April 2001 - Harald Huber has released a Dassault/Enaer Mirage 50CN &QUOT;Pantera&QUOT; for FS2000. The visual and flight models both need work and he has referred to this as &QUOT;1st Version&QUOT; so improvements may be forthcoming. In the meantime, have a look. 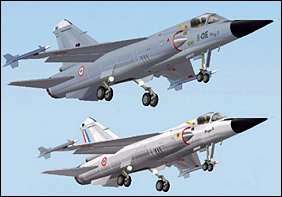 17 April 2001 - Renaud Dudon has made updates to his Mirage IIIE. Included are revisions to both the aircraft and the panel. 9 April 2001 - No new downloads this week but Jason Ashworth wrote to say that the Mirage IIIE visual model (see 17 February below) is nearly finished and will soon be ready for flight testing for the FDE. 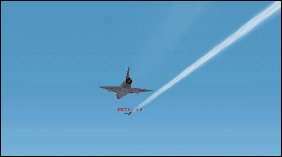 Phil Perrott of Alpha Simulations wrote to say they are planning an Armada Argentina Super Etendard add-on for their Harrier Jump Jet program and asked for images and cockpit photos. I was happy to send him all I had. 2 April 2001 - Anyone with a copy of Flight Simulator Design Studio (FSDS) by Abacus might want to try their hand at modifying or repainting one of Oxyd's creations; the Mirage 2000-5 or Rafale M. The source files and texture files are now available for your use. Just remember to properly credit the original designer. 26 March 2001 - This week Alpha Simulations will release their latest FS add-on package, Harrier Jump Jet. The subject is the Harrier V-STOL aircraft but the package revolves around the 1982 Falkland Islands War. Among the aircraft included is an IAI Dagger. I've been flying this aircraft for a few weeks now and have put together a photo review. 19 March 2001 - Oxyd has released new AIR files for his Mirage 2000-5F and Rafale M to increase maneuverability. These are version 2.1 updates. 15 March 2001 - Oxyd, who released his Mirage 2000-5F only last month, has completed his new Rafale M for FS2000. The aircraft includes panel and sound files. He has also continued to further refine the flight dynamics of his Mirage 2000 and has released a new AIR file. 9 March 2001 - A new Mirage F1 has become available. The aircraft was designed for FS2000. The designer, Kirk Olsson, has selected an aircraft from Spain's Ejército d'Aire in Tiger Meet markings as the subject. 7 March 2001 - Oxyd has released a new AIR file for his Mirage 2000-5F to correct an idle engine problem. His Rafale M (below) is coming along nicely. 3 March 2001 - I've been unable to find the time to repaint Colin Norwood's reworked Mirage IIIR/5BR AFX and PCX file set so I'm posting it to this website for anyone who is interested. The reconnaissance version of the Mirage III/5 was used by Belgium, Egypt, France, Pakistan, Saudi Arabia, South Africa, and Switzerland. So there are many possible paint schemes to be made. 25 February 2001 - The first new Mirage 2000 in four years has been released! Designed by Oxyd, the aircraft is a Mirage 2000-5F in the colors of Armée de l'Air, Escadrille 2/5 "Ile de France". This aircraft has plenty of detail since it was built using Flight Simulator Design Studio. It was designed for use FS2000 and CFS2. The download includes sound files and panel. 17 February 2001 - Jason Ashworth, who gave us his great Mirage F1 and Cheetah D is working on a new project. He sent a screen shot of a Mirage IIIE. This aircraft is being built using Flight Simulator Design Studio so it's being designed for FS2000 and CFS2. 9 February 2001 - If your computer has the horsepower I've added two Terrain Mesh scenery files covering the whole of France and Corsica. These are the work of Raimondo Taburet and offer stunning views and lots of sightseeing -- even at Mirage speeds. Be sure to read the text file. 2 February 2001 - Felix Rodriguez has been working on an IAI Kfir C7. The parts are falling into place as you can see in the image below. This aircraft is being built using Flight Simulator Design Studio so it's being designed for FS2000 and CFS2. 28 January 2001 - I've put together a photo review of Alpha Simulation's new Kfir C2. 20 January 2001 - Alpha Simulations has added an Israel Aircraft Industries Kfir C2 (below) to their FS Supermarket. Look for it in the "Others" section. I'll have a full review shortly. In the meantime, have a look at my review of Alpha's earlier Mirage IIIB-RV. 16 January 2001 - Renaud Dudon has put together a panel for the Mirage IIIC using Dave Haskell's IAI Kfir panel as a backdrop and instruments from various sources including Mike McCormack's Mirage F1AZ. I've also added a scenery file for the Iraqi military airfield at Tallil. 10 January 2001 - I found a Mirage IIIE repainted by Renaud Dudon in the colors of Armée de l'Air EC 1/2 "Les Cigognes" from the famous Tanguy et Laverdure comics. The base aircraft is the Mirage IIIE by Paul Kimberling and Joël Branchu. 6 January 2001 - I have added some new scenery for a few European air bases -- Koksijde AFB, Belgium; RAF Leuchars, UK; and Base d'Etain-Rouvres, France. These are all designed for FS2000. 4 January 2001 - This is the first update of the real New Millennium. I was asked to give some feedback on the Mirage IIIB (see below) by Alpha Simulations. If you had purchased this aircraft already you might want to download it again. There have been several changes and corrections made. If you haven't you might want to consider it. I'll have a full review shortly. 1 January 2001 - Happy New Year everyone. I hope the new millenium (the real one this time) brings each of you health, joy, and prosperity.